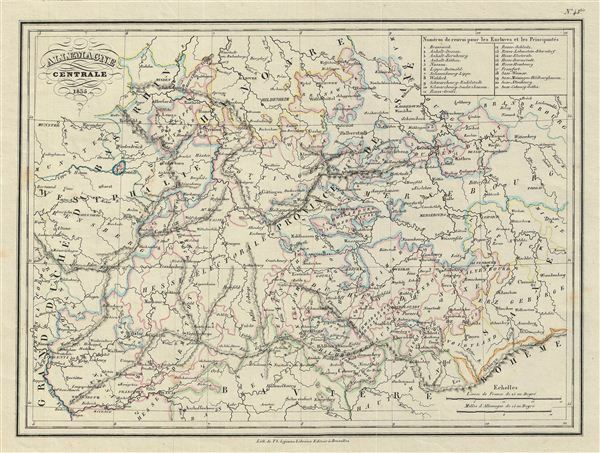 This is a fine example of the 1835 Malte-Brun map of Central Germany. Centered on Saxony, the map Covers from Rhineland and Westphalia to Bohemia and Brandenberg. A table in the upper right quadrant lists the numbers referring to the enclaves and principalities. In 1180 Duke Henry the Lion fell, and the medieval Duchy of Saxony dissolved. The Saxe-Wittenberg lands were passed among dynasties who took the tribal name Sachsen (Saxons) upstream as they conquered the lands of the Polabian Slavs further up the elbe. The Polabian Slavs had migrated to this area of Germany in the second half of the first millennium A.D., and had been largely assimilated by the Holy Roman empire by the time this map was made. Today, the German government recognizes some 60,000 'Sorbs,' or descendants of the Polabian Slavs, who have retained their language and culture. Rumsey 0458.041. Phillips (Atlases) P6079.